Which Oil Should I Use in My Weed Eater? Maintaining your own lawn – grass covered ground – is never easy. When it comes to looking after your backyard, one of the most time-consuming chores is mowing. It is always preferable to do it yourself, though, rather than hire mowing services. However tedious it may be, doing the mowing on your own has two prime benefits. It can save you cash and acts as great, free exercise too. If you don’t mow at all, grass will grow tall and your yard could end up more like a prairie than a lawn! In order to have a healthy and attractive lawn, there are some important points to be aware of. Mowing height and mowing frequency need to be observed. We will outline some sample heights below. – Cutting a lawn can be highly stressful for the grass. The leaves produce food for the roots so you need to be extremely cautious in your moves. – Weekly mowing is necessary from spring to fall seasons. The grass grows faster during these times (especially during summer). During these seasons, with the proper conditions, the grass uses most of its energy for growing making it doubly tough to maintain a neat lawn. And if you want to keep healthy turf, pay close attention to the advice listed below. Finally, finish the lawn mowing by trimming and edging the grass. It’s like giving yourself a shave after having a haircut. Bring out your weed eater and finish the job off nicely. Electric mowers: These have an electric motor which pushes a rotating blade. They are environmentally-friendly since they don’t emit any exhaust fumes. If you have lawns which are level then an electric mower is the smartest choice. A cordless type of electric mower has a bag on either the side or rear. This catches the clippings if you choose to bag. Another type is the one that cuts the grass so that it’s fine enough to let clippings fall on the ground and settle. Gas-powered mowers or lawn tractors: For larger yards, they are the most practical solution. One of the issues with regards to this type of mower is the exhaust emissions it produces while mowing which is very harmful not just to the environment but to humans as well. So try opting for a newer model. These are designed to produce less emissions. They also require regular maintenance. Manual-reel mowers: These manually-powered mowers truly are multi-purpose .They are a smart choice for the environment but they do require a lot of manpower. This type of mower leads to a need to cut the grass more often to keep it short. They also come in handy since they are very easy to store. Perfect for those lacking garage space and for those with small lawn areas! So, pay attention to some of the useful tips above. Know as much as possible about grass and how often it needs cutting. Check out the different types of grasses along with their recommended cutting height. And remember: the job isn’t done properly until you use your weed eater to finish it off in style! Weed eaters are some of the best tools available for cutting hard to reach weeds and keeping your yard looking neat; however, they cannot work well unless equipped with the right type of weed trimmer line. You might think that all trimmer lines are the same, but there’s nothing farther from the truth! There are many types of lines for sale that will help you accomplish different purposes. Choosing the best type for your needs is all a matter of knowing what you need and fitting the right line to this need. An average weed eater is not designed to accept just any type of line you have and will need a specific type to function properly. If you don’t choose the right type, you may not even be able to use the weed eater or it may run inefficiently. How can you know which types of line your weed eater takes? It should be listed in the owner’s manual of the device. There will be a model number given for the basic string that your device operates with as well as some information about alternative types of string for your machine. Before you purchase a weed eater, it’s good to know that the type of string it accepts is what you need to sort out your lawn’s issues. If you already own a weed eater, you can still change the types of lines you can use by installing a different trimmer head onto your current device. The head is the part of the weed eater that holds and spin the string, so if you replace it with a new head than you will be able to use a new type of line. Never assume that a spool of line will work with your device unless you know for sure that it’s the right type! Slight variations in the diameter or shape of the line can render your weed eater completely useless if they cannot be accommodated properly in the trimmer head. With that in mind, there are only two real ways that trimmer lines can differ. The size (diameter) and shape of the line are the only important facts to consider when making your choice. Occasionally a brand will offer some specialty line made of a different material or fitted to the trimmer head in a unique way, but in general these are not very important details for you to learn about to make the best choice of line. While you might be told that there are only a few generic shapes of line, this is actually incorrect. Some standard shapes do exist consistently from brand to brand, but then each brand will also make their own unique shapes of trimmer line that cannot be found with other companies. If you only want a basic, reliable, all-purpose trimmer line than you should be satisfied with round line. This is the standard type of line that comes stock in most home-use weed eaters. 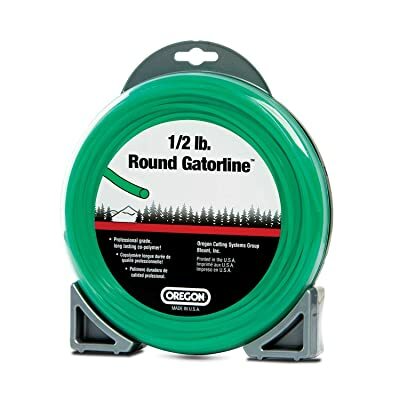 Round line is sturdy enough to cut well and does not break off quickly, making it ideal for longer sessions of cutting regular household weeds and grass. 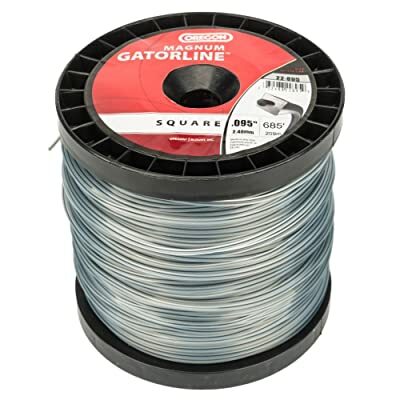 For a medium heavy duty line, try a square trimmer line. Square shaped lines can cut through much thicker weeds than round line and will make heavier cuts to whatever you are clearing away. Be careful when using this type of line around any sensitive items in the yard which might be damaged by it such as trees, shrubs, wooden fences, etc. 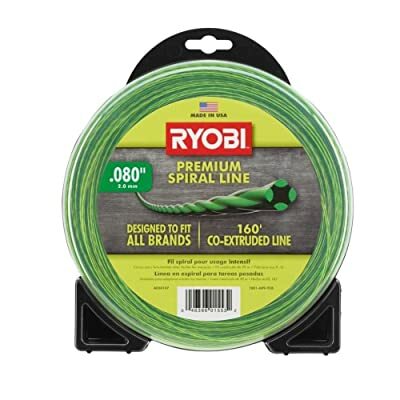 Like the square line, this shape is intended for use with medium and heavy duty jobs as it is stronger line against thick weeds and some brush. You’ll get a cleaner cut with lines that have more edges, but the downside is that the line is more fragile when it comes in contact with hard surfaces such as the driveway, curbs, and otherwise. Most often these shapes are used only in a commercial context. Lines that are twisted in shape offer very strong cutting strength for heavy workloads. These lines are usually a bit pricier than other types, but they offer a lot of advantages for that price. 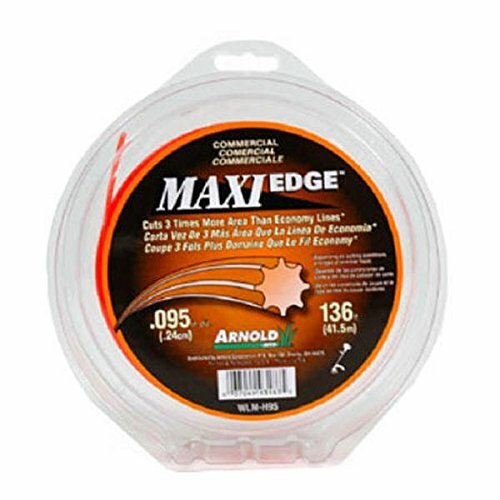 Not only do you get a line that can cut through almost anything would trouble, you also won’t have as much vibration coming through the line nor will the cutting be as loud as it is with many other commercial strength lines. Twisted trimmer lines are ideal for professional lawn care providers. With a serrated edge similar to that of a kitchen knife or a saw, this line shape has excellent cutting power. It cuts more quickly than some of the rounder shapes, but has a tendency to “snag” on the heavy weeds and feel as though the weed eater is getting pulled downwards. This is harmless, but you will have to make sure you can hold onto it when this happens. You can get a job done quickly with serrated line and it works well on medium-heavy weeds. Trimmer lines in any shape are available in multiple sizes. The thinner the line is, the harder time it will have with heavier brush. Larger line sizes can more easily cut through heavy weeds and brush and won’t break off as easily. As with the line shapes, not all trimmers accept various line sizes. Find out what the optimal line size range is for your trimmer and stick with it consistently. If you want a different size range, install a new trimmer head. The type of line you use won’t necessarily dictate how much you can accomplish, but it can make a big difference on how efficiently you are able to work. When it all comes down to it, you have to choose a trimmer line type that works with your weed eater. If you have a weed eater that only takes a certain line and you want to use a different kind, you might be able to change the trimmer head to adjust it. Otherwise, you need to read your owner’s manual or consult a technician to know what your options are. There are a number of accessories that you can use as attachments for a weed eater to accomplish certain landscaping tasks. Putting attachments on string trimmer heads make them useful as multipurpose and versatile tools rather than simple weed eaters. However, just because you have the attachments connected does not mean you will be able to intuitively know how to use them best. A ​Brush blade can be used as an attachment for cutting stubborn or thick grasses that cannot be cut with a spinning string. Some brush is simply too thick for your tool, making this attachment a useful addition to your arsenal. These attachments are available in different sizes ranging from 6 to 10 inches. Metal or plastic materials can be used to make the brush blade. Begin by sharpening the blade. Each attachment is put on in a different way so fit it to the weed eater following the instructions given by the weed eater manufacturer. Put on the blade shields, if included, to prevent debris and pebbles from flying off. Put on all the required safety gear and start clearing the grass. If you have ever cut with a string trimmer you will be able to cut with a brush blade attachment as they use the same mechanism except that the blade is more powerful and sharper. It should be handled with care to avoid any injury. If the weed eater gets entangled in the brush you need to first turn off the engine before checking on it. In many cities across the globe, homeowners with gardens and lawns (especially those at the front of their houses) are required to trim them and keep them neat on a regular basis. To keep a lawn, sidewalks and driveways clean you need to do more than trimming. You should learn how to edge these areas. Although you can do edging with a special type of shovel, the task is difficult and time-consuming and it does not guarantee a great result. But, with an edger you will get a perfect looking garden with only a little bit of practice. You don’t have to purchase an edger if you already own a weed eater, as you will be able to use an edging attachment on your weed eater. First, get your edging attachment and make sure that the one you have is compatible with y﻿﻿our weed eater. Start by attaching the edging blade. Make sure that the edger is at a right angle with the ground. It might look a little funny compared to the normal weed eater line but trust us it will work well! Now that the edging blade has been fitted into the weed whacker, it's time to start edging. Start the engine of your trimmer. Before you pull on the trigger to set the edger on the motion use the blade to find the edge of the concrete. From the trigger, you will be able to control the wheel blade’s speed. To be able to cut a clean line that is parallel with the sidewalk, you have to walk slowly forwards and backwards. You will find the backwards and forwards movement difficult initially but with time, you will master the act and you become a professional. The blower attachment will help you to clean your lawn or garden after cutting grass with your weed eater. First, get the attachment and fit it to your weed eater as directed by the manufacturer. It's recommended that you lay a tarp for trapping the particles and debris that will be blown away by the attachment head. Start your weed eater with the blower fitted on it. Pull on the throttle to check how it is working and to get familiarized with the mechanism of the machine. Now start blowing debris, moving towards the location of the tarp. You should be very careful at this point so that you don't end up wasting your effort and giving yourself more work to do by spreading grass clippings all around the yard again. Blow all the clippings onto the tarp and remove the waste to a mulch ground or green waste can. You may also use some of the waste to fertiliz﻿e your garden. Before the invention of weed eaters in 1972, families that had lawns and gardens around their homes, as well as gardeners, were using various tools. From hand-held clippers and manual lawn mowers to cutlasses, people found different solutions for triming the grass in their gardens. But in 1972, George Ballas made a wonderful discovery that eased the task not just for the people of his generation but for future generations. George Ballas invented the concept of using rapidly spinning string to trim away at thin organic materials like weeds, grass and thin shrubs. People around the world are now using weed eaters for personal and professional use. Weed eaters are sometimes known as weed whips, string trimmers, or weed whackers. These machines trim grasses and weeds with amazing performance and efficiency. Even though they do not have blades, they are capable of cutting grasses with string that spins at a high speed. As mentioned above, the weed eater was invented in 1972 by George Ballas of Houston, Texas. To the surprise of many people, he worked as a property developer, university lecturer, author and businessman and not an engineer or any other highly technical occupation. He was also the owner of a dance studio and a dancer who underwent military training and participated in a war. Like many others during that time, George did not like trimming with hand-held clippers. He got the idea for his first weed eater when he was watching car washers cleaning cars with the needle-like bristles of the brushes. He was surprised that his car could be washed with these brushes and nothing happened to its finishing. He thought of using the idea in creating something that would be able to cut and trim grasses to reduce the pain of pushing the lawn mower. He constructed the first weed trimmer with a tin popcorn can, a rotary from his lawn edger and some nylon fishing line. He created holes in the tin can and through the holes then ran the fishing line through those holes. Ballas took his invention further by collaborating with mechanical engineers to construct the weed whacker brand string trimmer. Today, the invention has spread widely and turned into many different models of weed whackers. There are now gas powered weed eaters and corded or battery powered electric weed eaters. As it turns out, many others had a desire to make trimming an easier job. This invention has made George Ballas a rich man. It was advertised on television and many consumers came to know about it. They started buying Ballas’ product, which was then sold by his company. About $80 million sales were made by 1977. However, George Ballas, who was dubbed Weed King, later sold his weed eater company in 1979 to Emerson. The company was then acquired by Poulan, who was purchased by Electrolux in 1986. George Ballas’s idea continues even today. No new invention has eclipsed it even though manifold innovations have been introduced by many brands. Using weed eaters to trim grass around the house and in the lawn is very popular today owing to the impressive results and the ease of working with this tool. A lot of people enjoy trimming grass with the machine, as it shortens the task considerably. While it's easy to figure out how to use a weed eater well, it is not totally risk-free. If you are trimming with weed eaters, there are a number of precautions that you should take to avoid getting wounded by the machine or even damaging the machine itself. 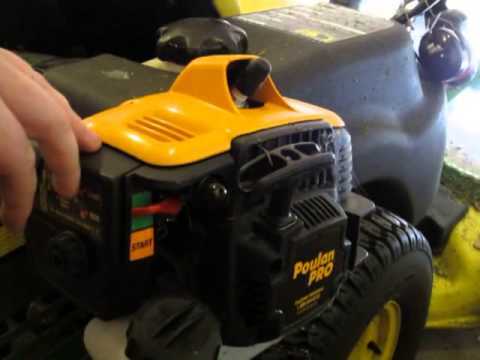 When working with an electric powered weed eater, you should first check the cord before plugging it into the power source. This will help you to avoid electrocution. If the cord is broken or torn so that a naked wire is exposed, you need to first cover the wire. You can use electrical tape to wrap round it in order to cover it. In this way, there is no danger or risk of electrocution, although you might experience shorts in the power if the cord is broken too badly. No matter the type of weed eater that you are working with, it is advisable that you first check the individual parts of the machine to make sure that everything is in order and functions properly. If all the parts of your machine are working and are in good condition before you start work, your machine will not only be at its optimal performance, it will also reduce the risk of injury occurring. For example, a loosened nut if not properly tightened can fly off during cutting and can injure you or another person. When you are trimming your lawn, especially if you are using electric trimmer, you have to cut with the tip of the l﻿﻿﻿﻿ine. The tip of the line spins at the highest speed; if you are cutting with it, you increase the efficiency of your machine. Additionally, weed eater line is designed to break off slowly as it encounters stronger resistance. If you try to use the center of the line, you might slow down the speed of the rotation or end up getting the line tangled in the brush you're trying to cut. Trimming around pots, fencing, pavements and other hard surfaces causes the line to slap against the hard surface repeatedly. 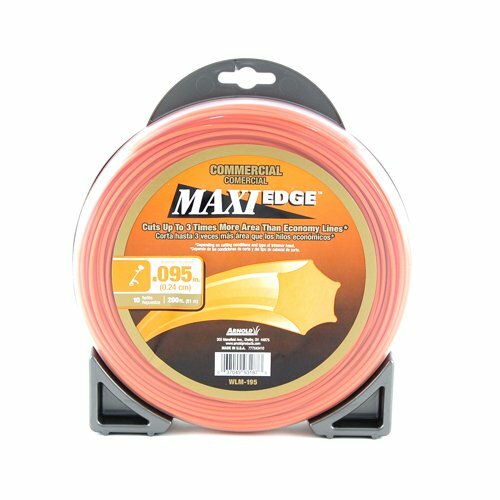 If you are trying to use the whole string to cut at once you will be causing unnecessary wear and tear on your line by allowing too much of it to hit the solid surfaces. Normally, as you are trimming the grasses in your lawn a lot of particles (including stones and pieces of grass) fly off the ground. The higher the rate at which these particles are flying, the higher the probability of pebbles and hard particles being thrown at you and wounding you. To help avoid getting injured by flying debris, you have to raise the machine a little bit from the ground as you are cutting. Doing so keeps the line from contacting any materials on the ground and throwing them around. Instead, you will only be hitting the grass you want to trim. The trimmer normally comes with a guard. You should angle the trimmer in such a way that the guard will protect you. Guards cannot block everything but they will minimize the amount of debris being tossed from the tool's cutting head. When trimming your garden, you should not allow the cutting head to rub off the ground. This is as simple as angling the trimmer's head properly. You should also adjust the head’s distance from the ground so that the entire line won't be rubbing off the surface of the ground. Doing this will also prolong the life of your string. If you are trimming around shrubs and trees, you should ensure that the string is not stripping the shrub’s or tree’s bark. The shrub or tree can die if its bark is stripped too much. Cut a safe distance away from the base of the plant. These are some of the basic precautions to take when you're using a weed eater. Following these tips can help you reduce the risk of injury or damage to your yard or tool. Some weed eaters are powered with electricity and batteries while some are powered with gasoline. Gas powered weed eaters are available in two types of engine specifications, namely two-cycle engines and four cycle engines. In the first type, the oil and gas are mixed together in the appropriate ratio and poured in one tank but in the second each has its separate tank. Whether you are using a two-cycle engine or a four cycle engine, it is important that you use the right type of oil and gas in your weed eater. Not every type of oil should go into your weed eater. Some oil types are like poison to the engine. Rather than enhancing your engine's life, it will spoil it. Read on to know the right type of oil and gas to be used in your weed eater. Before you pour any gasoline or oil in your weed eater, you have to make sure that it is the right type. Gas weed eaters usually take fresh, clean 87-octane regular unleaded fuel. The alcoholic content of the gasoline should not be more than 10%. If possible, choose Ethanol-free gasoline. DO NOT USE DIESEL FUEL. Similarly, it is not every type of oil that is good for your weed eater. Normally, the type of oil to be used will be indicated in the user manual of your weed eater. So, always check the user manual to find out what the right type of oil for it is. It differs from brand to brand. Commonly recommended types of oil for gasoline powered weed eaters are Paramount, Weed Eater, Poulan Pro and Poulan. But there are other good oil brands that can be used in weed eaters. If you are not able to find any of these products on the market or the manufacturer’s recommended type of oil on the market, rather than using any type of oil you should consider purchasing a premium weed eater oil for air cooled engines. On no account should you use boat engine oil or automotive oil on your weed eater. This is because these types of oil can damage the engine of your weed eater as they are not properly formulated. If you are using a two cycle engine, it is not enough to purchase the right type of oil. You have to also ensure that you use it in the correct ratio with the gasoline. If the fuel is greater than the oil, it will result in damage to the engine. The engine may even crack and knock. On the other hand, if there too much oil, the weed eater engine will generate heavy and oily smoke. The normal fuel and oil ration is 40:1. If you are pouring one gallon of gasoline in your weed eater, you will mix it with a 3.2-fluid once bottle of oil. Mix them together very well in a container before pouring them in the engine. It is not good to pour them into the engine separately, thinking that they will mix themselves. If you discover that the mixture ratio is not proper, it is advisable that you turn off the weed eater so that it will not be ruined. Empty the tank and then get the right mixture ratio before starting the engine again. Finding out when the ratio is improper is not difficult. The performance of the engine will tell you that. If the engine is generating heavy smoke, it may be a sign that there is too much oil in the mixture. If the engine is becoming too hot and making cracking sounds, it may be a sign that gasoline levels are too high. If you want to store your weed eater for a period of time that exceeds one month, it is advisable that you empty the fuel tank. This is because the longer gasoline is stored, the more gummy it becomes and gummy fuel can block the system. It will also eat away at the inside of the gas tank and might cause problems later on when you try to start the device. Fuel stabilizers might help for some engines but they are not recommended for weed eaters as the fuel also contains oil. 9 Destructive Garden Insects: How Can You Get Rid of Them?